Make smarter investment decisions with My Net Wealth®- it's FREE! We would like to offer you FREE access to our online investment service to help you make better, more informed investment decisions. 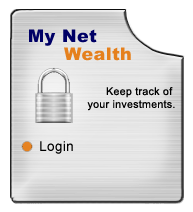 The service is called My Net Wealth® and allows you to view your consolidated portfolio information and total net wealth position online via this website 24 hours a day! You won't need to manually enter any financial information – we can organise that for you. Best of all, our website is available to you FREE of charge, 24 hours a day, 7 days a week. Being well informed is the key to maximising your wealth, and Ridgway Financial Services has the tools to help you. Our series of email Newsletters are designed to keep you abreast of all topical financial issues, whether it be new financial laws, investment tips, strategies to build your superannuation fund, or how to grow wealth for your children. Anyone can subscribe to our email Newsletter service! This quarterly investment newsletter keeps you up-to-date with general investment issues affecting your business, your family, your retirement and your investments. Access the latest information on the monthly performance of the major investment markets including share markets, property and fixed interest on Australian and International markets. Learn about our views on the general outlook for each market sector. Keep up-to-date on the performance of investment markets over the past financial quarter and the effect on your investment portfolio. If you are interested in subscribing to our email newsletters, call us on 07 4688 9111. In order for your investment information to be directed to My Net Wealth®, the registration process will nominate Ridgway Financial Services as your financial adviser. This nomination will result in Ridgway Financial Services receiving all ongoing commissions currently paid to your existing adviser. As a Member of Count Wealth Accountants®, Ridgway Financial Services is well equipped to help you with all your financial planning and tax needs under the one roof, saving you time and money. We are members of Count Financial Limited.